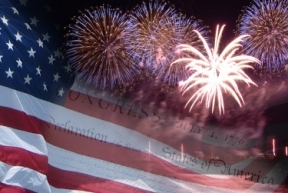 The Village of Lyons will host its annual 4th of July Independence Day celebration including a parade, children’s entertainment at Veteran’s Park and an evening of fireworks, Lyons Mayor Christopher Getty said Tuesday. Getty said this year’s celebration is again dedicated to the men and women of the U.S. Armed Forces who have served and are still serving in active duty defending our country overseas and at our military bases and institutions. Getty said that the parade will kick off at 1 pm on Saturday at 46th Street and Lawndale Avenue, heading to Joliet Avenue North to the Fire Station. A Kids Party will begin at 6:30 pm through 9 pm at Veteran’s Park featuring entertainment for families and children, face painting for the kids, food and music. The Fireworks display will begin at Dusk.